• Seagate and WD together captured 81% of the External HDD market. • Overall SSD (Internal and External) witnessed 20% sequential growth in terms of unit shipments. • QNAP Systems dominated the NAS (Network Attached Storage) market. 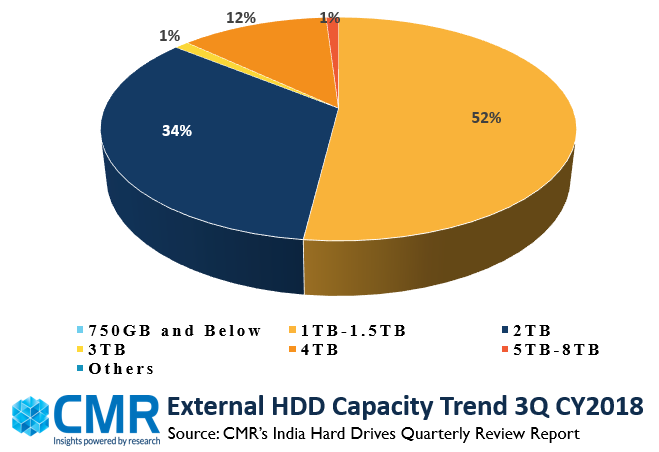 Gurugram/New Delhi, Dec 23 2018 : India External HDD market witnessed 24% growth when compared to 2Q CY2018 in terms of unit shipments, according to CMR’s India Hard Drive Market Review for 3Q CY2018. 2.5” form factor external HDD witnessed 28% sequential growth in terms of unit shipments. 3.5” form factor contributed just 1% to the external HDD market. 1 TB capacity segment remained the most popular among customers and contributed 52% market share followed by 2 TB contributing 34% market share with 44% sequential growth in terms of unit shipments. QNAP was the top contributor under NAS category with 39% market share followed by Netgear contributing 21% market share and witnessing 34% sequential growth in terms of unit shipments. Internal SSD was the major contributor with huge 95% share in terms of unit shipments. External SSD contributed just 5% of the overall SSD market. SATA as always was the most popular interface capturing 80% of the Internal SSD market due to its cost effectiveness. PCIE/NVMe interface saw huge 219% sequential growth in 3Q CY2018. Price of PCIe/NVMe reaching closer to the SATA interface due to 3D NAND technology is making it popular among the consumers looking for enhanced performance at a reasonable price. In terms of capacity, 240-480GB contributed 49% market share followed by 120-180GB category contributing 40% market share in terms of unit shipments in the Internal SSD market. “Cloud storage services along with the less production capacity by using 3D NAND technology is expected to obstruct the External HDD and SSDs market growth in future. Hence vendors should focus on enhancing the features and performance of their products in pipeline. We anticipate the External HDD market to drop down to around 4.5 Lacs on account of the year end and major festivals ending by then” added Shipra.